I spotted this handsome bird, this morning. I think he's a Great Egret, because of the color of his legs, but he sure is small, as you can see in the second photo. (That's a female golfer walking past.) Perhaps he's very young. Ok, I'm scrolling down looking a every photo and got to this one. I cracked up. The bird must be very young. 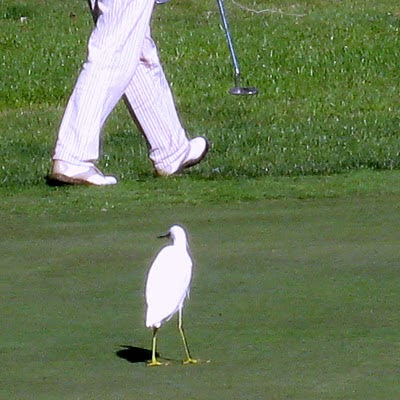 Not afraid of the passing golfer! I love these birds. We have a several at the wetlands.